Today, March 3rd, is World Wildlife Day. Every year there is a theme that brings attention to something that is threatening species all over the world. 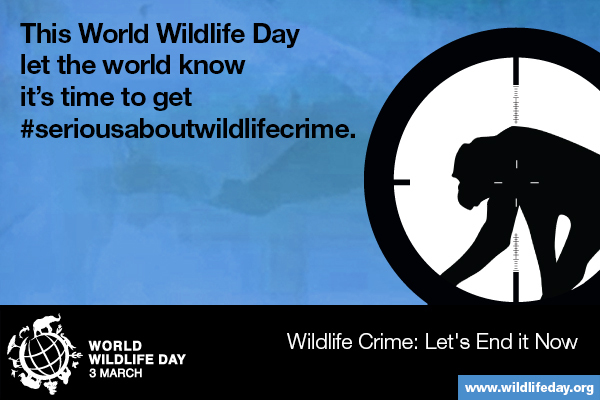 This year’s theme is #seriousaboutwildlifecrime. Wildlife crime includes things like the illegal poaching of animals or animal parts on the black market. 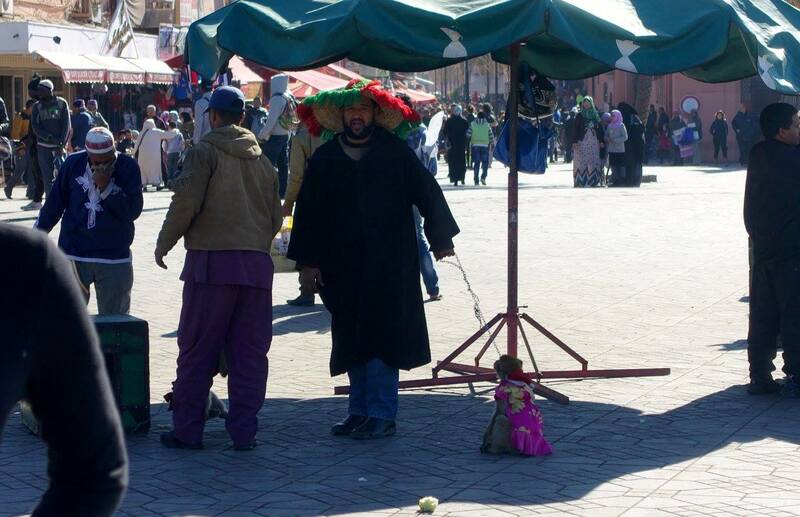 This be anything from an elephant tusk sold for jewelry to an infant chimpanzee sold as a pet. In honor of World Wildlife Day I want to tell you about an issue that is very close to my heart. I recently had the chance to meet Ian Redman, who works with Ape Alliance, and heard him speak about the illegal trade in great apes (chimpanzees, bonobos, orangutans and gorillas) and how this affects everyone. That’s right, it really does affect everyone, from the sheep farmers in Scotland to movie stars of Hollywood, everything on Earth would dramatically change without great apes. Something astounding about the great ape trade is that if a great ape is confiscated by local authorities, it is presumed that others had to die for it to get there. This does not paint a pretty picture and it is not fact for the faint of heart, but it is a story that needs to be told, so I implore you to read on. For every one chimpanzee confiscated it is assumed that there are anywhere from 5 to 10 adults that were killed. This is because chimpanzees live in complex social systems, so to be able to take an infant from a group you do not just need to kill the mother, but all of the other chimpanzees that would also try to defend that infant. This is the same with bonobos, however with gorillas it is assumed that only 2 adults are killed: both of the infants parents. Orangutans are solitary great apes, though they do live high in the trees. To capture an infant orangutan the mother is shot down from the tree, and when she has fallen sometime 50 feet to the ground, her infant (if it survived the fall) is pulled off of it’s mother’s body and sold into the pet trade. This means, accounting for all of the great apes counted, presumed dead, and those estimated losses that went undetected over 22,000 great apes were lost to the illegal trade between the years 2005-2011. But how does this affect you? These incredible creatures are the most important animals to their respective habitats. Without them seeds would not be dispersed and the forests would not grow. If the forests are not growing the entire planet’s climate shifts. You may not realize it but much of the rain that comes across America and Europe began in Africa or the Amazon. If you choose to keep a primate as a pet, even one that was purchased legally and bred in captivity, you are fueling the illegal trade. Just because you can easily purchase a primate in America that is legal, does not mean that this is the case everywhere. The more that these pets are socially acceptable and ‘in fashion’ the more that people all over the world will want them. This dramatically increases the primate trade globally, and has even led to the near extinction of primates like the slow loris. Often times when we travel it is easy to come across a man who will place a macaque in a brightly colored outfit on your shoulder, or maybe a make-shift ‘zoo’ will allow you to cuddle with an orangutan for a picture. These animals were not legally purchased. 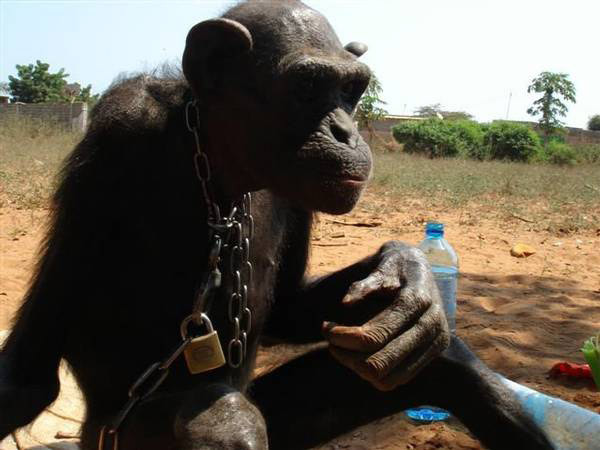 They were not bred in captivity, and their presence is one of the driving factors for wildlife trade. These people know that if they spend their money to purchase an infant great ape they can make that money back ten fold by charging unsuspecting tourists for photos. So, remember, if someone asks if you want to take a picture with a squirrel monkey on your shoulder just say no.